Employment screening procedures in most organisations are just a formality and not as stringent. Organisations are slow in ulitising information technology in facilitating employment screening. The challenge facing security and human resources professionals is finding ways to implement an effective pre-employment screening program that is also cost-effective. 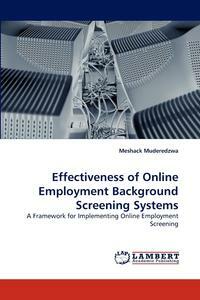 This book provides the benefits of online background screening, a model to assess IT effectiveness and a framework for implementing online employment background screening in light of recent developments in web service and cloud computing technologies. The analysis should be epecially useful to professionals in human resources departments, recruitment and employment agencies and professional background screeners or any other organisation considering hiring qualified employees for jobs.